Kasamatsu, Shiro (1898-1991) "Harvest" - Woodblock - Chinese and Japanese woodblock prints for sale, silkscreen, scrolls, watercolor, lithographs. 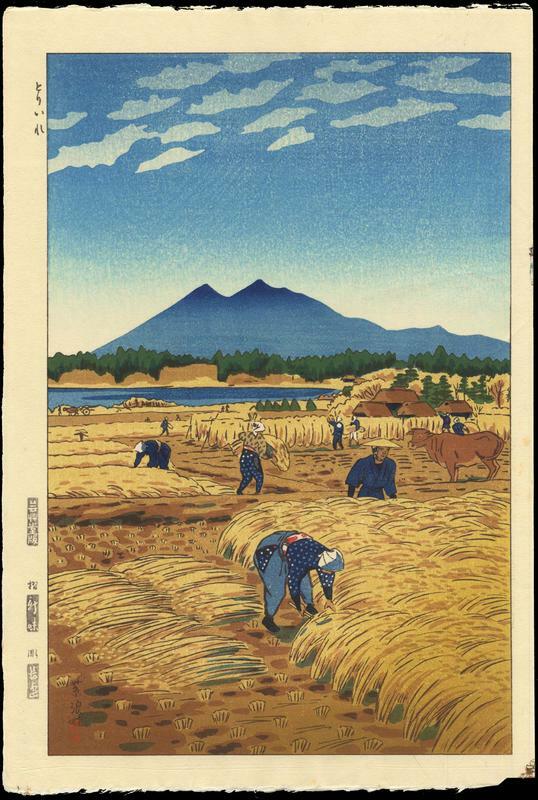 Artwork Details for Kasamatsu, Shiro (1898-1991) "Harvest"
Condition: Fine impression and condition. Full margins. No tears, creases, folds, foxing or stains. A couple of faint ink spots in right margin. Notes: This is a mid-edition by the original Unsodo printer of the first edition (Shinmi), not by the recent Unsodo printer. In the left margin are title, Unsodo publisher's seal, printer's seal, carver's seal, and Unsodo 'Gei' watermark. Kasamatsu signature and red seal at left of image. The cut-out in the bottom right corner (known as a 'kento cut') is due to the printing process. Shiro Kasamatsu ranks among the top ten Shin Hanga artists. He was born in 1896 and given the name Shiro (though with different kanji characters to those used on his prints). Kasamatsu studied Japanese-style paintings with Kaburagi Kiyochika, whose encouragement led Kasamatsu to begin designing woodblock prints for Watanabe in 1919. He published many prints with Watanabe in the 1930s and subsequently published many more with Unsodo from 1952 to 1959. In the 1960s he finished his affiliations with publishers and began self-carving and self-printing woodblock prints in the Sosaku Hanga style.